Google Analytics can be a real bore. Sifting through all that data can be time consuming, mind-numbing and, worst of all, often fruitless. Unless you know exactly what you’re looking for it can be hard to find the information that you’re after. Though it needn’t be like this! With our collection of SEO dashboards for Google Analytics you can add simple widgets to your Analytics account, allowing you to digest data in a matter of seconds. 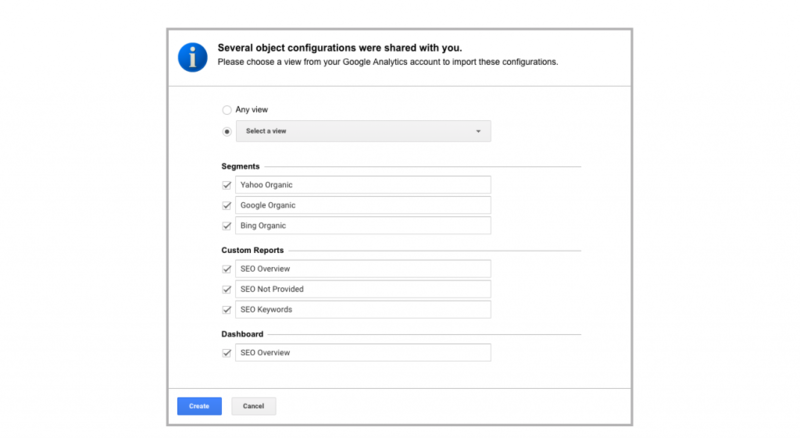 Your Google Analytics account will allow you to add up to 12 widgets to each dashboard, creating the easiest way to read and understand SEO data in one simple snapshot. Combining the most important SEO metrics, these reports will help you get a full grasp on how search efforts are panning out. 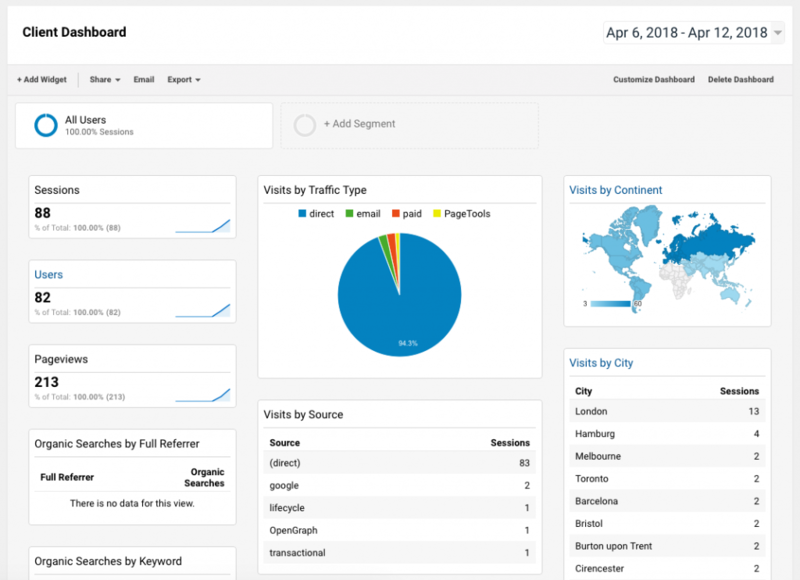 You can create your own custom SEO dashboard to display the precise data that you want, though if you’re looking to save time the following dashboards can be imported into your Analytics account for free. The Complete SEO Starter Pack contains an SEO dashboard, custom reports and segments to analyse and report on your all of your SEO efforts. 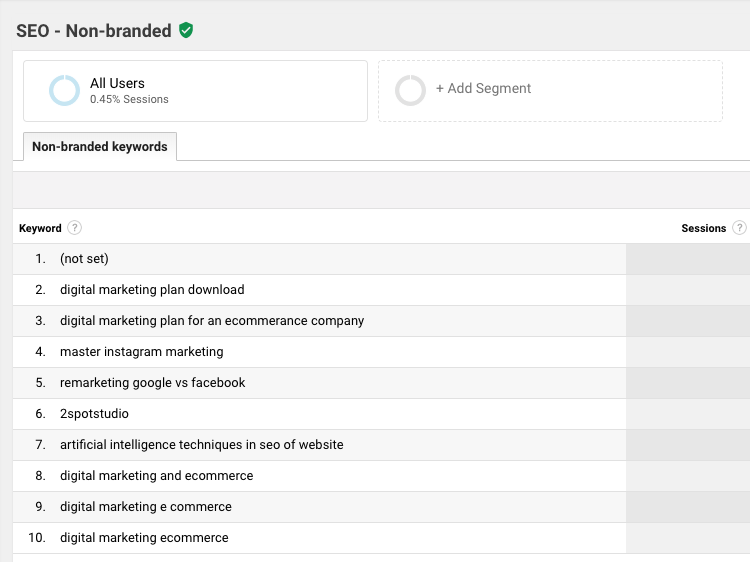 You can use the reports to understand your available keywords (that are provided) and drill down into your unknown keywords (that are not provided). The starter pack will also segment traffic from Bing, Yahoo and Google. 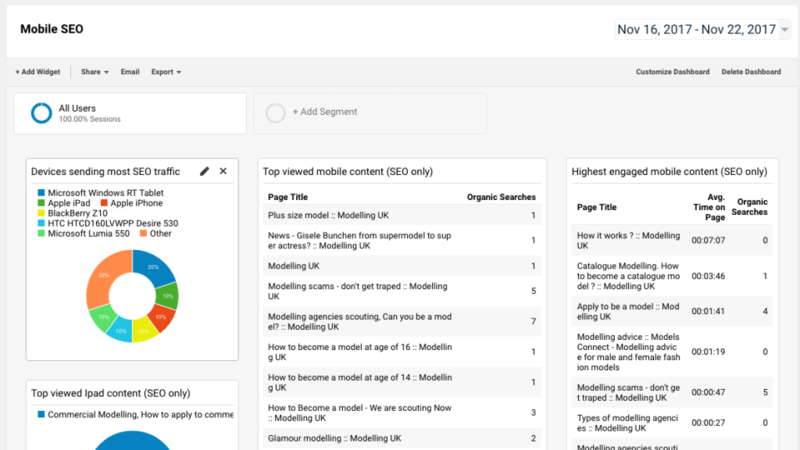 This SEO reporting suite comes from James Gurd, who runs a specialist eCommerce consultancy called Digital Juggler. 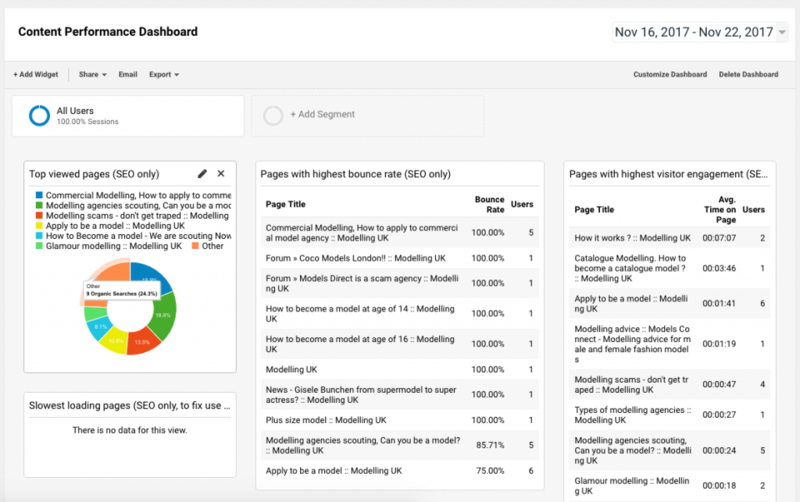 This dashboard is very simple and comes with a whole heap of widgets to help you understand your important keywords, landing pages and eCommerce metrics. 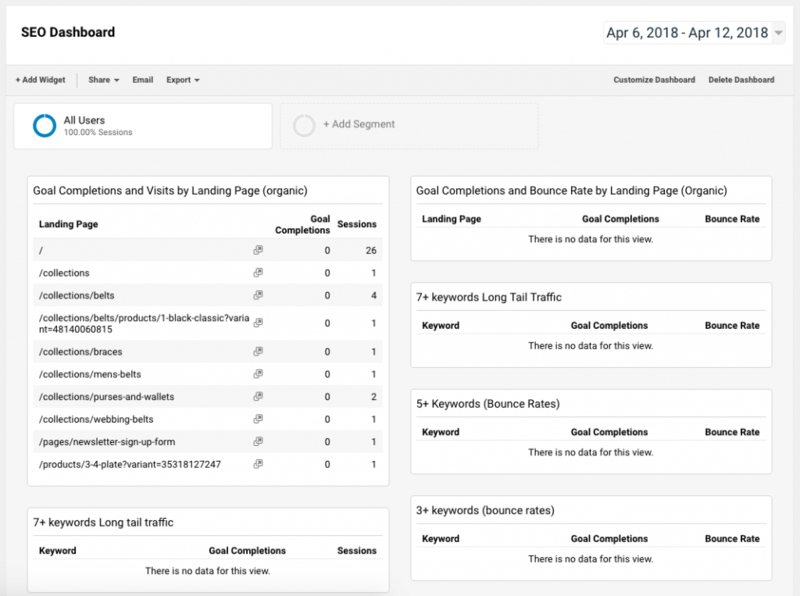 This SEO dashboard filters out branded keywords and focuses instead on goal completions and revenue from search. In order to customise the report you will have to go to ‘Edit’ and change the excluded keyword to your brand name. If you are working on your SEO, you best be setting goals. If not, you’re doing it wrong. Thankfully this dashboard helps you track your SEO goals so you can figure out exactly what’s going on. Visits – the total number of visits to the website. Bounce Rate – the quality of the users visiting your website. Goal Completions – with your goals set this will show you how many completed them at a glance. Goal Conversion Rate – the amount of goals per visitor. Goal 1, Goal 2, Goal 3 Completions – the goals that you want to measure. For instance, making a purchase, or signing up. Transactions – for eCommerce websites, this is pretty invaluable. This dashboard gives you a view of the top landing pages by goal completions. At the same time, you can see top long tail keywords by conversion and bounce rates for future content marketing ideas. Before you begin you will need to set up custom goals and ensure that your tracking is correctly configured. By looking at what pages are getting high traffic and high bounce rates, for example, you can look to A/B test your layout to improve results. Increasing page speed, too, will dramatically help with SEO efforts as well as UX. Increasingly users are not only researching, but making purchases via mobile devices. And with Google making efforts to prioritise mobile results first, your SEO efforts should be looking at mobile as well as desktop. 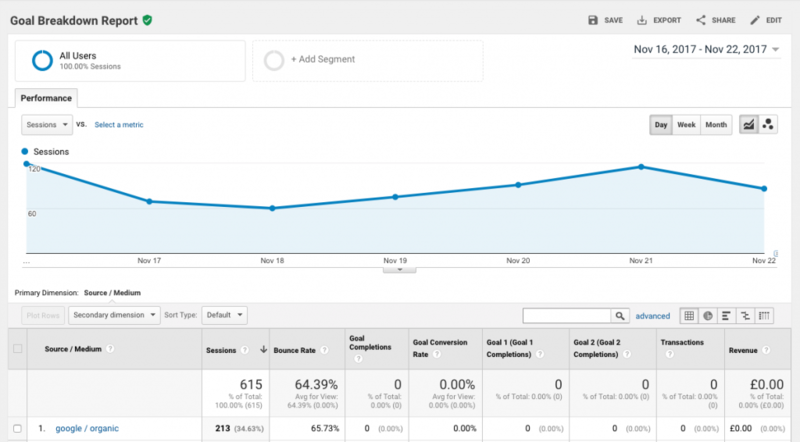 Monitoring these metrics will help you discover where to improve your mobile SEO efforts. 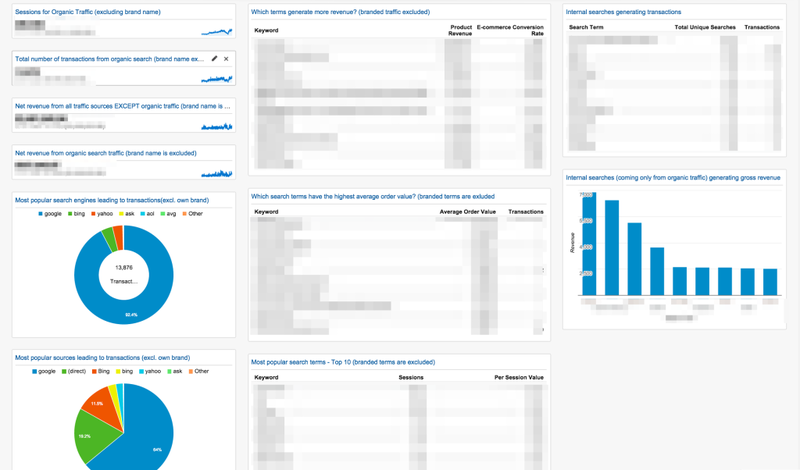 This eCommerce dashboard will give you an in-depth analysis of your SEO efforts. You will be be able to see if your non-branded organic traffic generates higher revenue and transactions than your other traffic sources. The best part of this dashboard is that it will demonstrably show whether your SEO efforts are profitable in both quantifiable and measurable results. The perfect dashboard for your SEO clients. Answer the most common questions that your clients might have without having to get into deep and complicated reports. Show some love to it’s creator Wilco here. Enjoy our SEO dashboards? Subscribe to keep updated!